Fertilizer Canada Launches New Online Course: Anhydrous Ammonia On The Farm | Chatham-Kent Agriculture Development | We Grow For the World! To help mark Canadian Ag Safety Week, Fertilizer Canada is taking a step forward to advance safety and security of anhydrous ammonia on the farm with the launch of a new eLearning course. Anhydrous Ammonia Safety and the Farmer is an eLearning course, provided by Fertilizer Canada, in partnership with the Canadian Association of Agri-Retailers (CAAR), to equip farmers with the knowledge to ensure that anhydrous ammonia fertilizer is handled safely. Anhydrous ammonia is a highly effective fertilizer that helps farmers feed our growing population and replenish nutrients in the soil. As a fertilizer, it provides essential nitrogen for plants, and is imperative that proper precautions are taken to ensure that it is handled correctly. “Our mandate is to continue working with industry stakeholders who share our commitment to enhancing the knowledge and safety of agri-retailers and their farmer customers across Canada. Today, we are happy to be a part of this announcement that will make safety and security knowledge at the farm level accessible to everyone,” said Delaney Ross Burtnack, President & CEO of CAAR. Ensuring fertilizer safety requires coordination among all stakeholders, from facility to farm gate. The Canadian fertilizer industry champions industry-led, world-class Codes of Practice to manage the risks of fertilizer products throughout their life-cycle. 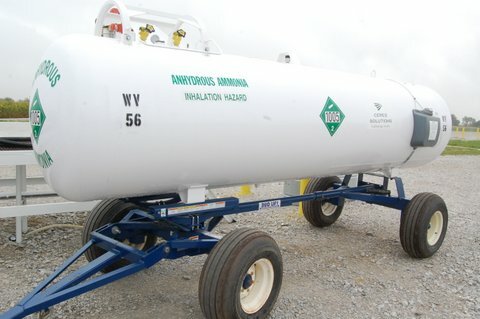 Agri-retailers and farmers wishing to refresh their knowledge of anhydrous ammonia safety and security can train for free today by logging on to Fertilizer Canada’s eLearning website: elearning.fertilizercanada.ca. By using the promo code “AgSafety” the online exam can be taken free of charge.